I don’t know if you remember but back in september, I wrote a post about the swiss brand l’Alpage. As I said in my last post (you can find it here) my first encounter with the brand blew me away. As this picture may suggest, I’ve kept on being impressed with the products. I’m going to start with the mask from the Inalp range. It’s a mask that is supposed to be mattifying and smoothing, it is called the Mattifying & Smoothing Face Mask Anti-Pollution*. The founder of the brand also told me that it might tingle when you first apply it and that you can leave it on for as long as you want, as it doesn’t dry out like a clay mask would. After several use of this mask, I can confirm that everything is true. When I take it off, I can immediately feel that my skin is smoother and much much softer. The mattifying effect is also obvious. It doesn’t last very long on me but the day after using it, my skin is definitely less shiny than it usually is. When I apply it, which I usually do with a brush because it’s more precise and makes you use less product, I do feel a slight tingling feeling but it doesn’t last very long and isn’t too uncomfortable. I also agree with the claim that you can wear it for as long as you want. I can leave it on for an hour and it never dries completely, it therefore doesn’t make the skin tight like a clay mask does and remains comfortable to wear the whole time. I also really appreciate the fact that you need very little product to do the whole face. I’ve used it about ten times and only used a quarter of the pot. This means that the pot will last a really long time ! I actually have nothing bad to say about this mask. It does what it says it does and like I said in my previous post, I really like the philosophy of the brand. You can find this mask on their website, here, for 39.95 CHF, on which website you can also find the stores that stock the brand. 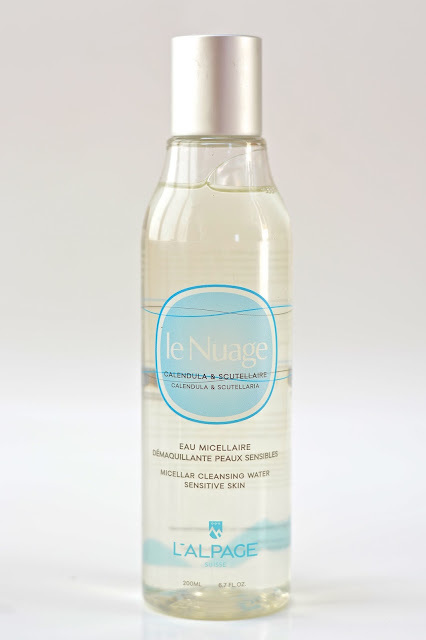 The second product I want to talk to you about is the Micellar Cleansing Water Sensitive Skin* from the range called Le Nuage. I’m completely smitten with this micellar water that takes off all my makeup as well as my eye makeup (as long as I’m not wearing waterproof mascara) without irritating the skin or stinging the eyes. It’s a micellar water that has a very interesting texture. It’s thicker than most micellar water and almost has a gel consistency. But it doesn’t affect its efficiency, I even wonder if it doesn’t make it glide on the skin more smoothly. I think that’s all I have to say about it. It’s a brilliant micellar water. It takes makeup off very easily and doesn’t sting my eyes and that’s all I really ask for. It’s a bit up-there in price but to be honest I still haven’t found a cheap micellar water that I really really like and of course, natural and locally sourced ingredient are pricier. You’ve just got to determine what matters most to you. You can find it on the website, here, for 24.95 CHF, or in one of the stores that stock l’Alpage. Lastly, I had also bought the Moisturising Complete Care Gel in the L’Alpiniste range for my dad. I promised that I would tell you how he’s getting on with it, so here comes. My dad always applies his moisturizer on his eyes and he’s really happy that this one doesn’t sting his eyes. For him, a good moisturizer has to be very hydrating, all day long, but most of all, it cannot be sticky, at all. This moisturizer checks both boxes. However, he finds that the scent is too strong for his liking, though I actually really like it. If a man in your life is looking for a good hydrating day cream, why not try this one. You can find it here for 56.95 CHF as well as in the stores that sell the brand. Have you tried anything from l’Alpage ?